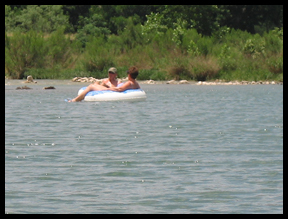 Texans love to float the rivers of the Texas Hill Country in summer and there is no better place to do it than South Llano River State Park. The park boasts 1 1/2 miles of river frontage. If you want to float the entire 1 1/2 miles the put-in is at the bridge as you enter the park. The take-out is clearly marked at the day-use area. Be sure to heed the signs here for if you stay on the river the next place to take-out is 8-10 hours downstream in your float or tube. You will truly know the feeling of a lazy summer day on the river as you float your way over the deep pools of dark blue water and the mini-rapids of swirling white foam. Anything that floats is fun, from inner tubes to air mattresses. You may rent a tube at the park headquarters for $5 per day. If you would like to kayak longer stretches of the river contact an outfitter for a shuttle (and rental if you need it) to Telegraph which will be an 8-10 hour float to the South Llano River State Park, or you may put-in at designated Crossing #2, then it is a 6-8 hour float to the South Llano River State Park. 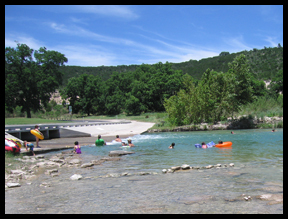 If you wish to float from the South Llano River State Park downstream to Flat Rock this is an 8-10 hour float. Again, be sure to arrange shuttle service or leave a second vehicle at Flat Rock for your return. Flat Rock does have parking available. Telegraph and Road Crossing #2 do not have parking. South Llano River State Park is located at 1927 Park Road 73 approximately 6 miles outside the town of Junction, Texas. This entry was posted in State Parks, Texas, Things to do in Texas, Uncategorized and tagged canoe or kayak Texas Hill Country river, canoe or kayak the South Llano River, floating on the river at the South Llano River State Park, tubing the South Llano River. Bookmark the permalink.